As a result, the dispute between a Japanese car importer and a former import car dealer has law enforcement baffled as to who actually owns the vehicle. According to a Daytona Beach Police report, the seizure comes after a woman associated with a Japanese car importing operation reported the car stolen from her driveway in early April. About two weeks later, police discovered the allegedly-swiped vehicle at a car show in Daytona, but were told by the former imported car dealer—who was apparently showing the car off at the show—that the vehicle doesn’t actually belong to the importer, but rather to the dealer. It’s a confounding case for sure, and it only gets weirder from here. It’s unclear how long the relationship went on—the report only describes it as an “extended period of time”—but Kim told police Stagnitta had sold “multiple vehicles” that she had brought into the states. But at some point, the pair’s relationship soured, the report said. It’s not exactly clear why that happened. Stagnitta wouldn’t discuss their relationship in detail when reached Wednesday over Facebook. Kim didn’t seem interested in talking, either. When we called the number in the police report listed for Kim, someone answered but then quickly hung up. Repeated calls went straight to voicemail. We were able to reach Kim’s husband on Thursday morning, but he said he’d have to call us back later. We haven’t heard from him yet but will update if we do. Yet the now-seized red Skyline may be the reason why the business relationship ended on such bad terms. As written in the report, Stagnitta had told Kim he would sell the 1999 Nissan Skyline GT-R for her. (And based on the now-deleted post above, which we found on the “Black Ops Squad,” a car owner’s club related to Black Ops Performance, it appears that he did try to sell the car). The report goes on, saying “weeks passed” but Kim didn’t hear back from Stagnitta, so she called him to have her vehicle returned. “Kim got her vehicle back, and she had parked it in her driveway,” the police report says. It’s not clear exactly when Kim got her car back, but on April 6, according to the report, Kim discovered the Skyline went “missing from her driveway.” She reported the car stolen to the Philadelphia Police Department, which declined to comment on the situation Wednesday. Kim then contacted Stagnitta, who reportedly “gave her the runaround” by telling her the car was in California, then in Orlando. Kim allegedly flew to both locations, eventually catching up with Stagnitta in Daytona, where the Skyline from her driveway was found at a car show in Daytona Beach. It’s there that police took possession of the car and towed it away to an impound lot, according to the report. As of now, it’s stuck in a custody battle, with Kim and Stagnitta at the center. According to the report, Kim was able to show the police the Skyline’s Pennsylvania registration and also a picture of a title on her phone. 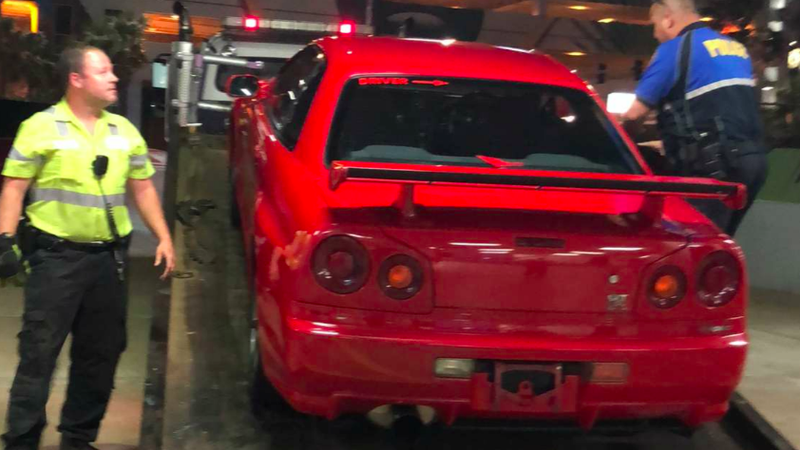 It’s unclear how she’d have been able to register the vehicle considering the U.S.’s strict 25-year import rule, although some R34 Skylines have exceptions there—rare exceptions. According to the report, Stagnitta told officers he had the “Bill of De-Registration from Japan,” that he’d bought the car from Kim over two years ago, and that he doesn’t believe the car has ever been registered or titled in the U.S.
We spoke with Stagnitta over Facebook messenger about the situation, and he told us that his team is involved in a lawsuit with Kim, that the car actually belongs to one of his clients (Stagnitta would not tell me if he sold the car to this client, or how the client got the car), and that he thinks the client will get the car back soon. “We are confident the vehicle will be recovered by our client shortly. I will contact you with a result of the other lawsuit when it resolves﻿,” he said. Stagnitta has had previous runs-in with the law. Police in Brevard County, Florida, arrested Stagnitta for schemes to defraud and grand theft, when he sold an unspecified engine to someone on the Internet for $1,200—but allegedly never sent the part. “[The victim] made an agreement to purchase a car engine from John Stagnitta for $1,200 over the Internet,” an affidavit requesting criminal charges states. “[The victim mailed] the cashiers check to Stagnitta ... on 02/02/04 and Stagnitta received the check on 02/03/04. The check was cashed, however, [the victim] never received the engine which he purchased.” The affidavit went on to say that Stagnitta admitted that he received the funds, and remained adamant that he sent the engine to [the victim], but during an interview he couldn’t provide any proof. Court records show Stagnitta struck a plea agreement with prosecutors, and received probation for the grand theft count while the other charges were dismissed. Stagnitta was arrested again for violating his probation in 2006, but was soon after released, according to court records. When questioned about his past, Stagnitta declined to comment on any legal matters. Stagnitta has also been having legal troubles more recently. In March of this year, Stagnitta and his company were sued in Florida state court by a plaintiff named Joshua Velasco-Cariaga for conversion, civil theft, breach of contract and fraud. According to the lawsuit, Stagnitta’s business, Black Ops Performance, allegedly received money from Cariaga last fall to finance the purchase of a “custom vehicle” from Japan. That money allegedly included a $1,500 initial deposit, and then $25,000, which Black Ops Performance had reportedly told Cariaga to pay as soon as the imported-car dealership had “secured” a car in Japan. There’s still a lot we don’t know, especially since we haven’t been able to find much of anything on the car importer, Kim. Records show she and her husband have had civil judgments filed against them stretching back to the 1980s, but she appears to have no online presence whatsoever. A google search on import-related car forums found only a couple of references to a “Ms. Kim,” but they don’t provide any detail on who she actually is. We did find that there appears to be ongoing import-related activity operating out of Kim’s listed address in the police report. Shipping records show a company named JDM Exchange Corporation is operating out of the same location in Philadelphia. A bill of lading from last month shows that used car parts were shipped from Japan to Newark, intended for JDM Exchange, and an eBay user by the name of jdmexchange2005 is currently selling an array of Japanese car parts and shipping them out of the Philly area. Update 10:30 P.M. Thursday: I reached Ms. Kim over the phone this evening, and she told me she has the Nissan Skyline back after proving to Daytona police that it’s her car. “I showed all documents. A lot of documents. [The detective] see them. So he release the car,” she told me. This post has been updated with screenshots where Facebook embeds once were, as Black Ops seems to have disappeared from social media.